The second September survey running from 27th-5th October covered a whopping 159.8 nautical miles, despite some unsettled and unwelcoming Scottish weather. As such, this survey concentrated on the waters around Ullapool, scanning lochs and bays along the coast of the mainland. We stayed in some picturesque anchorages during the survey (despite the weather! 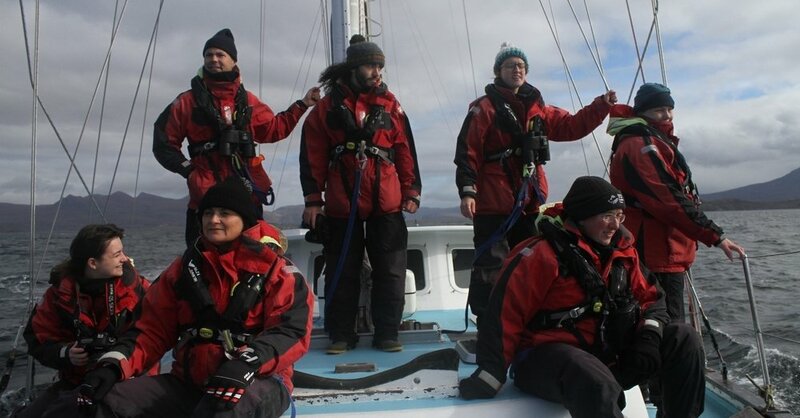 ), with expeditions from Ullapool allowing us to reach some very remote areas of the West coast. One highlight for the team was our anchorage at the Isle of Martin, where we went ashore to explore the varied wildlife and were immediately greeted by the overwhelming community spirit of the island. Our team of dedicated explorers trekked across the island to the west coast beach which looks out into the Minch, with silhouettes of the summer isles perfecting a beautiful scene in the evening sun. During the survey we encountered four species of marine mammals, including grey seals, harbour porpoise and common dolphins. One very special encounter occurred on the morning of the 1st October, when more settled weather conditions meant that everyone was in good spirits and there was an air of optimism within the group! Sure enough a yell of “sighting” was soon heard. As fins emerged from the water and it became clear that Silurian was in the presence of pilot whales! The vessel was soon surrounded by 25 animals including three calves! We saw hundreds of gannets, some diving amongst the pilot whales. Long-finned pilot whales can grow up to 7.6 m and we certainly had some big males in the group, which are distinguishable by their large, broad dorsal fins. Some of the individuals raised their heads vertically out of the water to have a better view of Silurian, a behaviour known as spy-hopping. We were even able to hear them underwater as they swam repeatedly around the vessel, recording an incredible array of clicks and whistles (listen below). 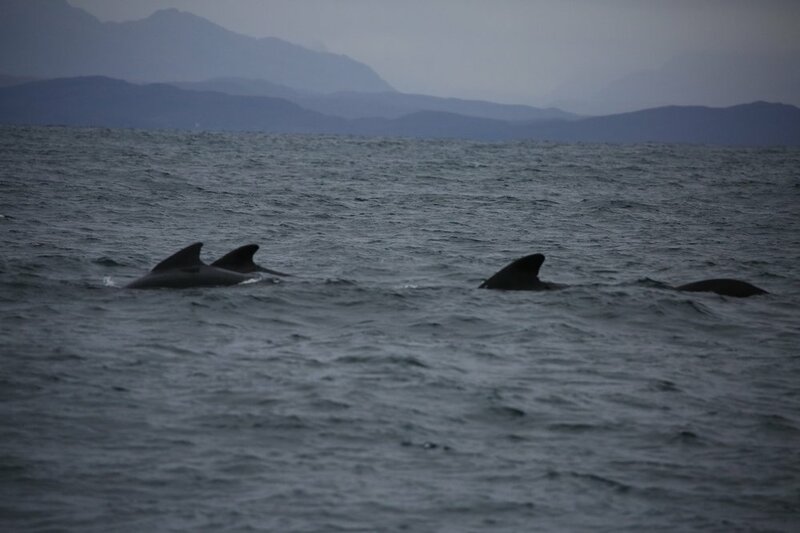 This was truly a special encounter for everyone on board and even though we have had reports of pilot whales this was the first ever time that pilot whales have been encountered from Silurian in its 16 years of surveying! Massive thanks to all of the citizen scientists that joined us on board: Farrell, Sarah, Keilidh, Margreet, Rachel, and Claire– we could not collect our vital data without you, and it was such a pleasure having you on board!